Last Saturday was an action packed day. 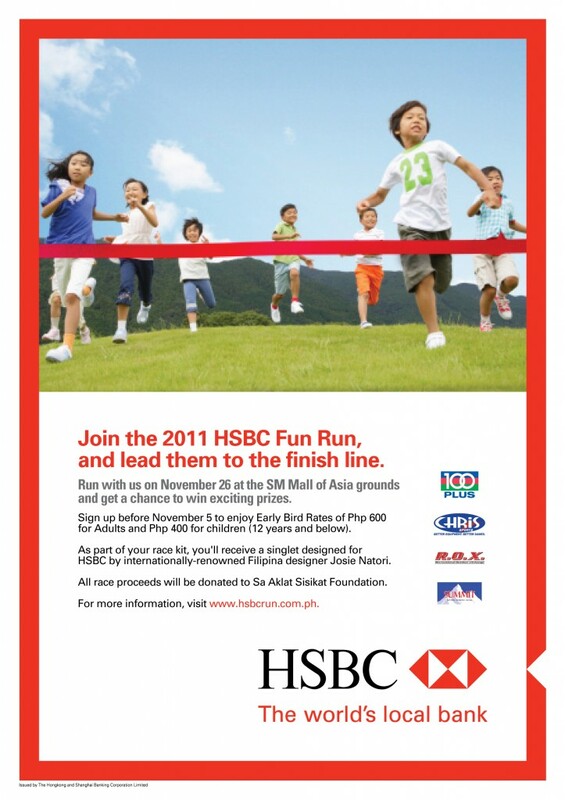 We had to wake up early for the Hsbc run at the SM Mall of Asia grounds. We arrived around 5:30am and the sky was still dark but most of the runners were already there warming themselves up. Gun start for the 10km run was at 5:45am while the race category which we joined (5km) started at 5:50am. We ran, jogged and walked our way from the starting point to the finish line. It was quite tiring but fun. Good thing there were cups of water given in specific areas during the run sponsored by Summit Drinking Water. We got to the finish line after 41 mins and 32 seconds. After the race, all runners lined up to claim their loot bags which includes the Hsbc water bottle, Hsbc baller id, and the Hsbc finisher's shirt. We were hoping to get the red finisher shirt but too bad the shirt included only came in one color which was black. 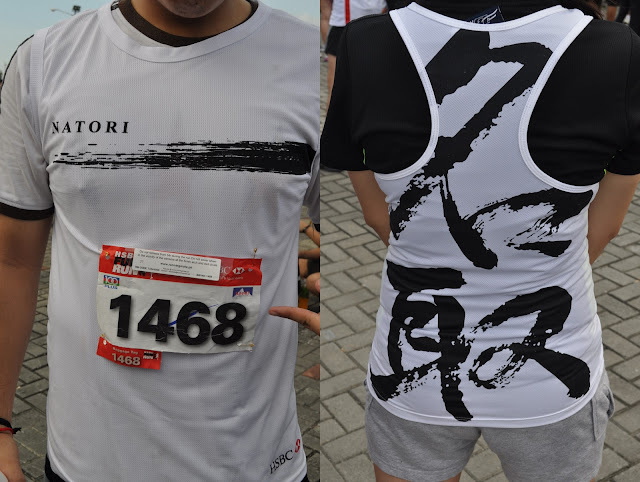 Good thing we loved the Natori designed singlet. It was just beautiful and unique especially with the Japanese character. We also lined up for a free sample of Goody Gulp Chocolate Milk Drink by Spongebob Squarepants which is made from New Zealand milk with no preservatives. Taste was great but it was more on the milky side rather than chocolatey. Besides, we were there to enjoy the fun run and did not bother much on our rankings. The top male and female runner in each category gets to win a trip to Hong Kong for 2 though. How I wish it was us. But no, we were not that fast. In the end, we only got to take pictures with the winning boarding pass tickets. He looked so happy as if he had really won the tickets! 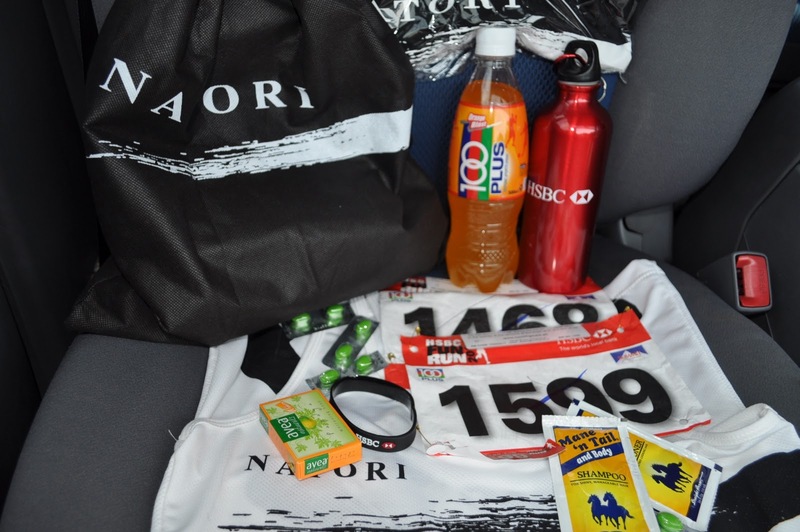 These were the loots we got from the race. The loot bag with baller id, water bottle, and finisher's shirt. A bottle of 100 Plus sports drink, Avea Papaya soap sample, Mane 'n Tail sachet of shampoo and conditioner, and some malunggay capsules.